SIMB is pleased to announce the winner of the first David Perlman Award. Posted 9/29/15 by SIMB. Filed under Featured News, News and Updates. Robert Schwartz, Abbott Labs (ret.) and editor-in-chief of the SIMB Journal of Industrial Microbiology and Biotechnology (2010-2015) has been selected as the 2015 David Perlman Awardee. The award will be presented in conjunction with the SIMB Recent Advances in Fermentation Technology (RAFT) conferences. This year’s RAFT conference will be held November 8-11 in Clearwater Beach, Florida. Dr. Robert D. Schwartz recently retired as a Senior Development Scientist in Fermentation Development at Abbott Laboratories, North Chicago, IL. Bob received his BS in biology from Brooklyn College (1964), MS in microbiology from Long Island University (1967) and PhD. in microbial genetics from the Waksman Institute of Microbiology, Rutgers University (1969). Before coming to Abbott (1987) he worked at: the Germfree Life Research Center (1969-1970) doing cancer research; Exxon Research and Engineering Co. (1970-1976) working on petroleum microbiology; Union Carbide (1976-1979) developing fermentation processes for producing specialty and commodity chemicals; Stauffer Chemical Co. (1979-1987) developing fermentation processes, based on dairy solids, for the food industry. At Abbott (1987-2007) Bob’s responsibilities included fermentation development and process support for bio-rational pesticides, e.g. DiPel, XenTari, VectoBac, VectoLex, plant growth regulators and other Ag related processes. As a fermentation microbiologist with interest primarily in industrial microbiology, Bob holds 12 patents and has 35 publications. Bob is a member of SIMB, ASM, AAAS, BIOT division of ACS and Sigma Xi. 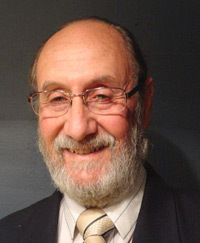 A member of SIMB since 1973, his service includes: President (1991-1992); Director (1983-1986); Editorial Board member (1985-1996), Senior Editor (1996-2010) and Editor-in-Chief (2010-present) JIMB. Bob received the SIMB Charles Porter Award in 1989 and was elected SIMB Fellow in 1994. Bob has also been a member of the Advisory Board (1989-1993) and Associate Editor (1993-present) of Enzyme and Microb. Technol., and served on the Editorial Board of Appl. Environ. Microbiol. (1980-1985). Continue slogging ahead, as the 21t century is just getting going.